The Arsenal shirt sponsor from 2005 to 2006 was O2. Match worn and signed Seb Larsson shirt. 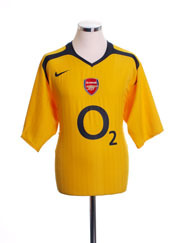 This is the shirt Freddie Ljungberg wore in the 1st half of the 2006 CL Final vs Barcalona. It has'nt been washed since the match and has slightly mud marks on it in places. A piece of Arsenal history. Very good quality official Nike replica shirt. Small Mens. Only reason for selling is the controversial move of Robin Van Persie to Manchester United. Relive Thierry Henry’s 2005/2006 Premier League with this original Nike away football shirt.